Not to be confused with Kearney County, Nebraska. Kearney is the principal city of the Kearney, Nebraska Micropolitan Statistical Area, which consists of Buffalo and Kearney counties. As of the census  of 2010, there were 30,787 people, 12,201 households, and 7,015 families residing in the city. The population density was 2,410.9 inhabitants per square mile (930.9/km2). There were 12,738 housing units at an average density of 997.5 per square mile (385.1/km2). The racial makeup of the city was 92.3% White, 1.0% African American, 0.3% Native American, 1.8% Asian, 3.1% from other races, and 1.4% from two or more races. Hispanic or Latino of any race were 7.3% of the population. There were 12,201 households of which 29.4% had children under the age of 18 living with them, 43.7% were married couples living together, 9.9% had a female householder with no husband present, 4.0% had a male householder with no wife present, and 42.5% were non-families. 30.4% of all households were made up of individuals and 9% had someone living alone who was 65 years of age or older. The average household size was 2.36 and the average family size was 2.96. The median age in the city was 29 years. 22.2% of residents were under the age of 18; 20.5% were between the ages of 18 and 24; 25.6% were from 25 to 44; 20.6% were from 45 to 64; and 11.1% were 65 years of age or older. The gender makeup of the city was 48.9% male and 51.1% female. As of the census of 2000, there were 29,952 people, 10,549 households, and 6,160 families residing in the city. The population density was 2,498.5 people per square mile (964.6/km2). There were 11,099 housing units at an average density of 1,010.9 per square mile (390.3/km2). The racial makeup of the city was 95.18% White, 0.63% African American, 0.38% Native American, 0.92% Asian, 0.04% Pacific Islander, 1.68% from other races, and 1.17% from two or more races. Hispanic or Latino of any race were 4.08% of the population. There were 10,549 households out of which 30.3% had children under the age of 18 living with them, 45.7% were married couples living together, 9.7% had a female householder with no husband present, and 41.6% were non-families. 28.7% of all households were made up of individuals and 9.5% had someone living alone who was 65 years of age or older. The average household size was 2.37 and the average family size was 2.96. In the city, the population was spread out with 22.2% under the age of 18, 23.9% from 18 to 24, 26.2% from 25 to 44, 17.1% from 45 to 64, and 10.6% who were 65 years of age or older. The median age was 27 years. For every 100 females, there were 92.6 males. For every 100 females age 18 and over, there were 89.7 males. The median income for a household in the city was $34,829, and the median income for a family was $46,650. Males had a median income of $30,150 versus $22,366 for females. The per capita income for the city was $17,713. About 7.4% of families and 13.4% of the population were below the poverty line, including 11.8% of those under age 18 and 8.9% of those age 65 or over. Parade of U.S. Infantry through Kearney, Nebraska, 1888. The original settlement in the area was called Dobytown, located 2 miles (3.2 km) southeast of the present-day Kearney. 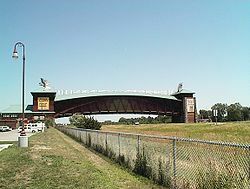 Later the city was moved and renamed after the nearby Fort Kearny (with an extra "e" added, but pronounced the same), a United States Army outpost along the Oregon Trail in the middle of the 19th century. The fort was named after Colonel (later General) Stephen W. Kearny. The "e" was added by mistake sometime afterwards by postmen who consistently misspelled the town name;  eventually it just stuck. The current location of the city is on the north side of the Platte River and steadily grew as a result of the influence of the railroad. The council-manager form is used in Kearney. The City Council makes legislative and policy-making decisions. There are five members elected citywide to serve four-year terms which are staggered. The council manager form of government was adopted in 1950. Michael W. Morgan currently serves as city manager. University of Nebraska at Kearney (UNK) is located in the city. The campus is a 235-acre (0.95 km2) residential campus with more than 37 buildings. It was founded in 1905 as Nebraska State Normal School at Kearney and became Nebraska State Teachers College in 1921. Between 1963 and 1991 the school was known as Kearney State College. The college's name was changed to University of Nebraska at Kearney in 1991 when it joined the University of Nebraska system. Companies headquartered in Kearney include Citizens Telecommunications Company of Nebraska and Buckle. It has been suggested that Kearney Memorial Field be merged into this section. ( Discuss) Proposed since October 2018. Kearney is home to several museums, many of which reflect its location on the California, Mormon, Oregon, and Pony Express trails, and the Lincoln Highway. ^ "Nebraska Pronunciation Guide". Associated Press. Archived from the original on 2010-03-12. Retrieved 2010-01-28. ^ United States Census Bureau. "Census of Population and Housing". Archived from the original on May 12, 2015. Retrieved June 22, 2013. ^ "Annual Estimates of the Resident Population: April 1, 2010 to July 1, 2012". Archived from the original on October 19, 2013. Retrieved June 22, 2013. ^ Ellis, Mark (2006). Kearney. Arcadia Publishing. p. 7. ISBN 9780738541280. ^ "Diocese of Grand Island". Catholic-Hierarchy. Retrieved 2013-06-04. ^ "Diocese of Grand Island". Giga Catholic. Retrieved 2013-06-04. ^ http://www.cityofkearney.org/documents/Administration/Kearney%20Connection%20December%202008.PDF[ permanent dead link] The Kearney Connection. Retrieved 2009-08-13. ^ City of Kearney: Form of Government. Retrieved 2009-08-13. ^ "District Snapshot" Archived 2011-07-26 at the Wayback Machine. Kearney Public Schools. Retrieved 2009-11-05. ^ "About YRTC—Kearney". Nebraska Department of Health & Human Services. Archived from the original on 2011-07-18. Retrieved 2009-11-06. ^ "About Us". Classic Car Collection. Retrieved August 24, 2016. ^ Schmidt, Kim (October 2, 2011). ""Dexter" producer, a Kearney native, says episode will be set in Nebraska". Lexch.com. ^ Korbeik, Jeff (Sep 26, 2011). "In new season, 'Dexter' takes a closer look at its Nebraska roots". Lincoln Journal Star. ^ Fowler, Matt (November 13, 2011). "Dexter: 'Nebraska' Review". IGN. ^ Alston, Joshua (November 13, 2011). "Dexter: 'Nebraska'". AV Club. "Kearney" . Encyclopædia Britannica (11th ed.). 1911.